Kevin moved from his native town of Bognor Regis with a burning ambition to become a successful stand up comic. Once he had conquered his initial fears Kevin quickly became a regular at many clubs. He also got through to The Laughing Horse new act of the Year Final 2002 and came second in the Krater New act of the Year 2002 at the Komedia in Brighton. In 2006 he did his first and very well received Edinburgh show Kevin Shepherd: Comics Die in Hot Cars. His friendly face and manic energy are proving successful with all types of audience. He is equally at home performing a set or compering. Clubs that he has played at include The Banana Cabaret, The Frog and Bucket, The Comedy Club Ltd, The Comedy Café, Jongluers and Highlight. In 2009 he was asked to performed support slots for if.comeddies nominees, Mickey Flanagan and Ivan Brackenbury on their national tours. 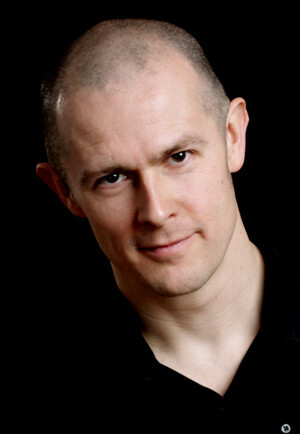 This year Kevin as well as performing his own Edinburgh show Kevin Shepherd: Caronicle he has helped direct, write and edit Tom Binns’ 2011 show ‘Ian D Montford – Spirit Comedium’. He has also tried he hand at acting, recently body doubling for Ralph Fiennes as Voldermort in Harry Potter and the Deathly Hallows. As well as performing live stand up he has been a regular co-host on The Grid a motorsports show on Sports Tonight Live, has a regular Formula One Podcast (Another F1 Podcast) with fellow Comic Terry Saunders and has written for BBC television (CBBC F1 Red Button coverage) and Radio 2 (Hot Gossip with Claudia Winkleman). Most recently after three years of writing, directing and editing Edinburgh shows with Tom Binns, Kevin has worked with Radio 2 and Tom on his new radio series ‘Ian D Montford is Unbelievable‘. “He then gave way to Kevin Shepherd, who packed the next 20 or so minutes with as many jokes as some comedians manage in an hour. He switched between anecdotal and punchline based humour with ease, and left us eager for more.” BBC Lincolnshire. “Very Funny, Did a tough gig in Torquay the other night and was a pleasure mainly due to this mans professional compering skills. Warm, friendly and fun to watch. I'd say in the next couple of years he'll be Mc'ing the big venues and you won't be able to afford him, so book him now.”Jason Manford. Channel 4. “Kevin's friendly face and light touch comedy was a hit with the Knutters. He got hold of the audience and held them to the end, they really listened and laughed.” King Knut's Club. Peterborough. “A charming young chap with cheek, humour, wit and a smooth delivery that would do any midwife proud. Lots of life, lots of gags and quite a few kids to his name.” Jester Laugh Comedy Club. Bournemouth.